I've been enjoying the new Ali Edwards Story stamps and kits. This month's theme is Gatherings and I've really been embracing the words and trying to tell some stories that pertain to the theme. So here goes. Thrifting. Gathering. I come by it honestly. My mom was and still is the biggest garage saler you will ever meet. My siblings also love antiques, auctions and picking. For me, I love a good thrift store or flea market. There's no pressure and you can wander around and linger as long as you like. I can spend several hours in just one store. Case in point last Friday. It had been a long week of helping out with a school event and I was around a lot of people. I'm so used to being by myself every day just hanging out with Charlie in my home. It gets to me. Not that I don't like to be around people but home is best. It's quiet and I can be one with my thoughts. 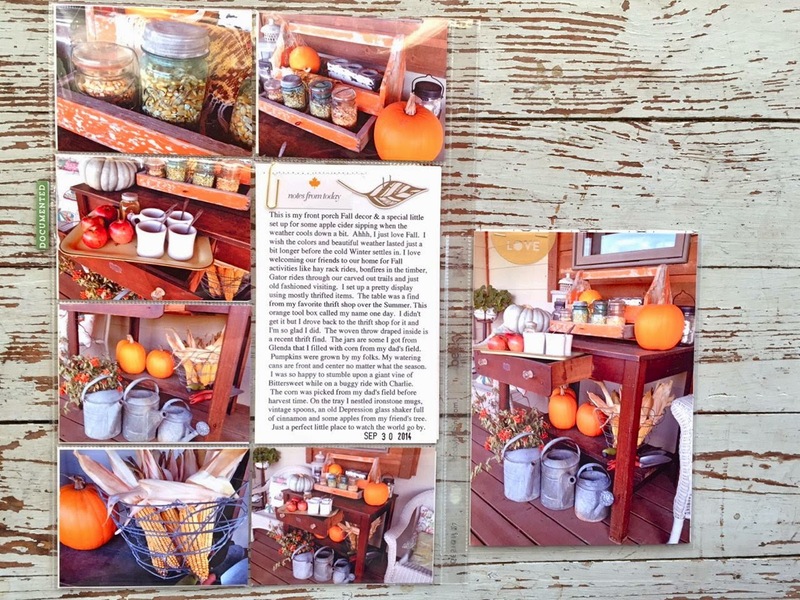 About once a month I do get the itch to go junkin'. Part of it is the thrill of finding something good. Something old, something that calls my name, something that evokes a memory, something that connects me to my past. 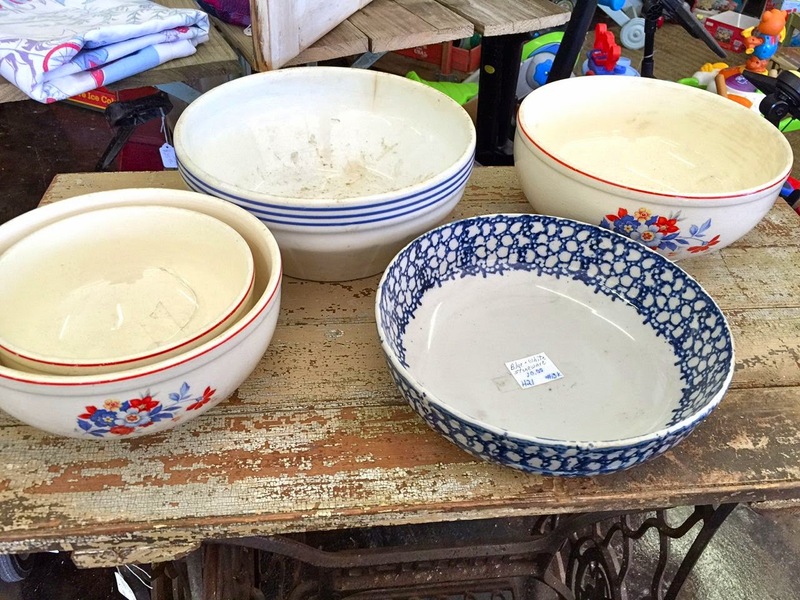 These red, white and blue bowls were speaking to me today. I guess I have an old kindred soul because they instantly made me picture a farm wife in her little white house, mixing up a dinner or putting a ball of bread dough on the window sill to rise. 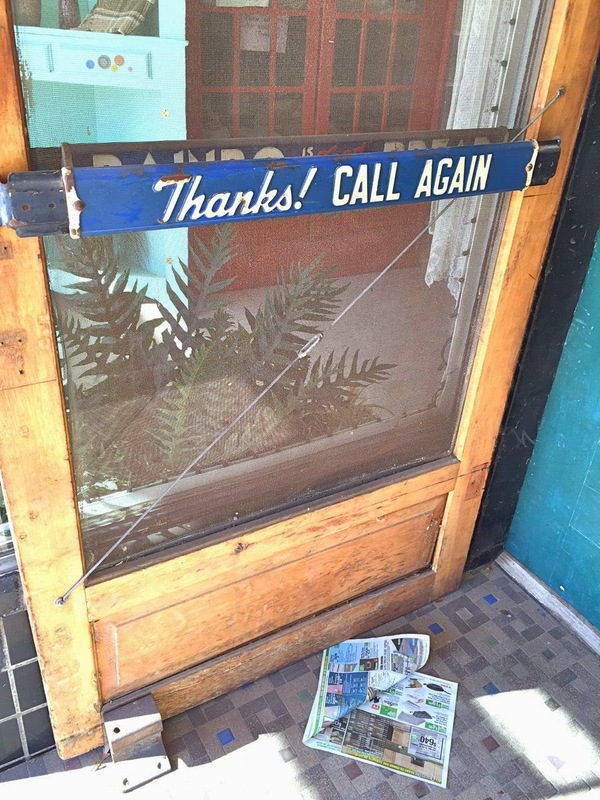 I love the peacefulness I get when I look at old junk. It reminds me of all the stories my dad tells me and makes me wish I could go back to those times too. Maybe a time when things were simpler. When there weren't so many distractions in the world. When things weren't plastic. So I left that thrift store with these pretty bowls. I also left with a clear head and a feeling that life had slowed down a little. 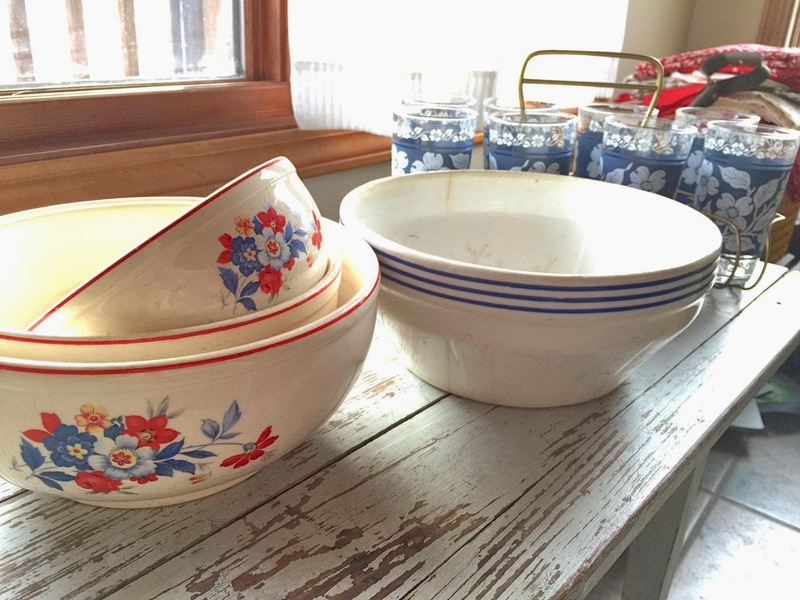 You can bet that there will be a ball of bread dough rising in one of these bowls soon. On my window sill with a vintage tea towel over it. Life is good today. Edit: Guys, I'm sorry but I made an error which has now been corrected in my post. There is not a 10 x 12 insert, it's an 8 x 12 insert which was cut down from a Project Life Z page protector. 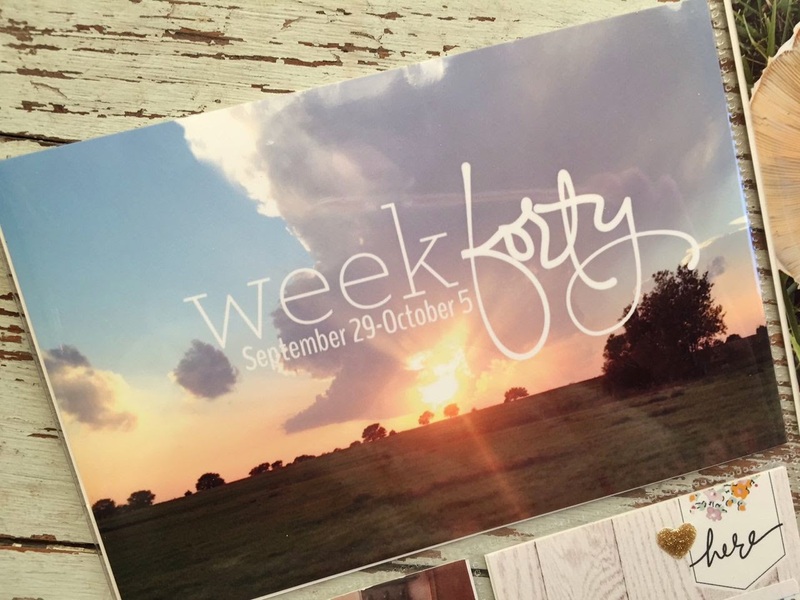 Just finished Week 40 of my 2014 Project Life. Instead of stressing about behind behind and getting caught up, I'm totally embracing my new simple outlook and getting more of the stories told. 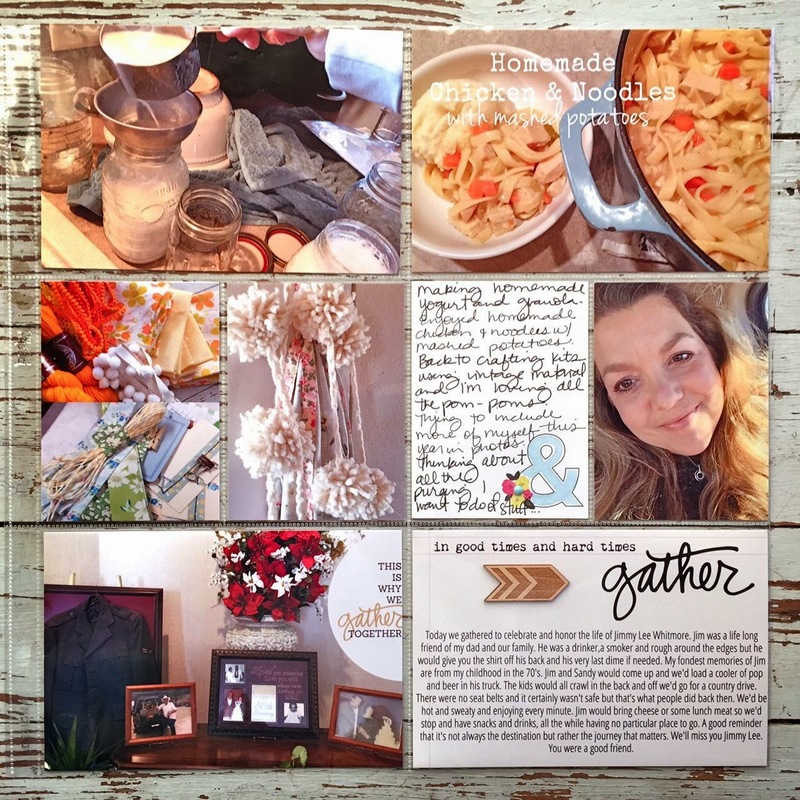 It's a new challenge to see what kind of a total package I can pull together for a weekly spread. This week was just a joy to create. Hang with me, lots of photos but I'll keep the chit chat to a minimum. For Week 40 I've got a two page spread plus two inserts. All inserts were printed from One Little Bird. Here's what the two page spread looks like with no inserts. 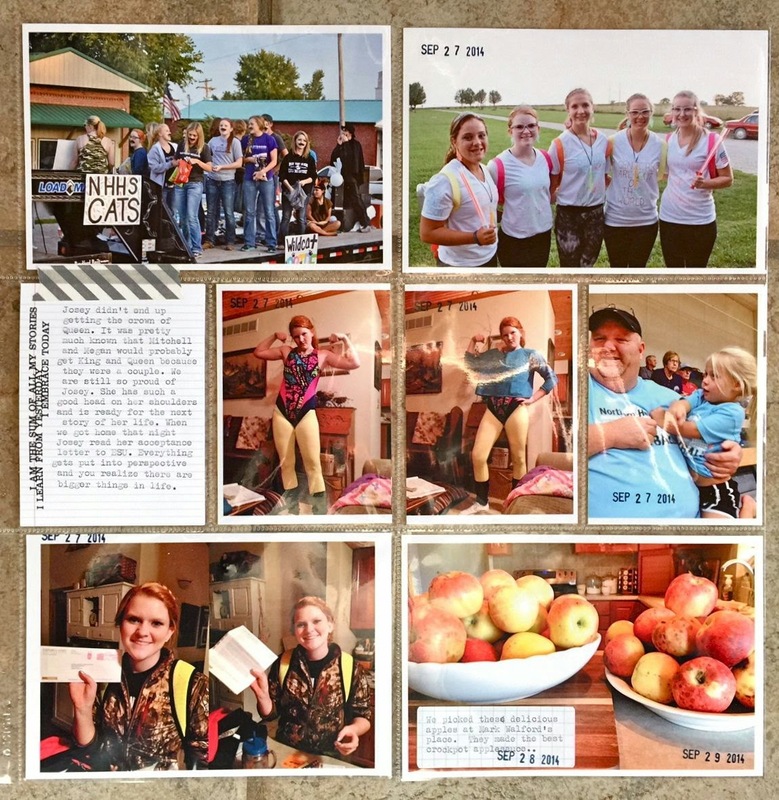 The left page was just random photos from the week with a single journaling card acting as a week in review. 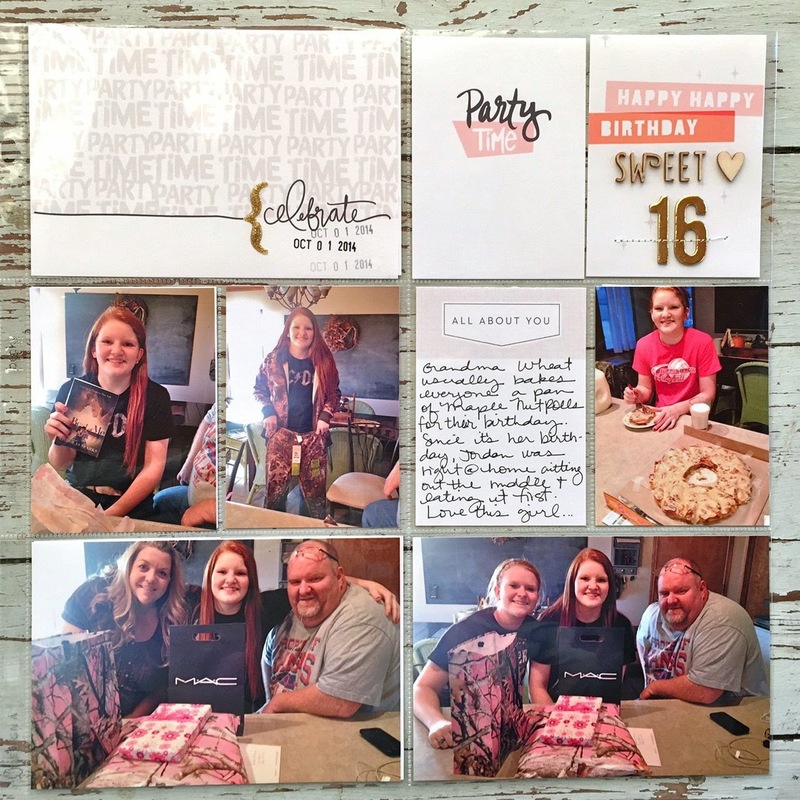 The right page is all dedicated to Jordan's 16th birthday. 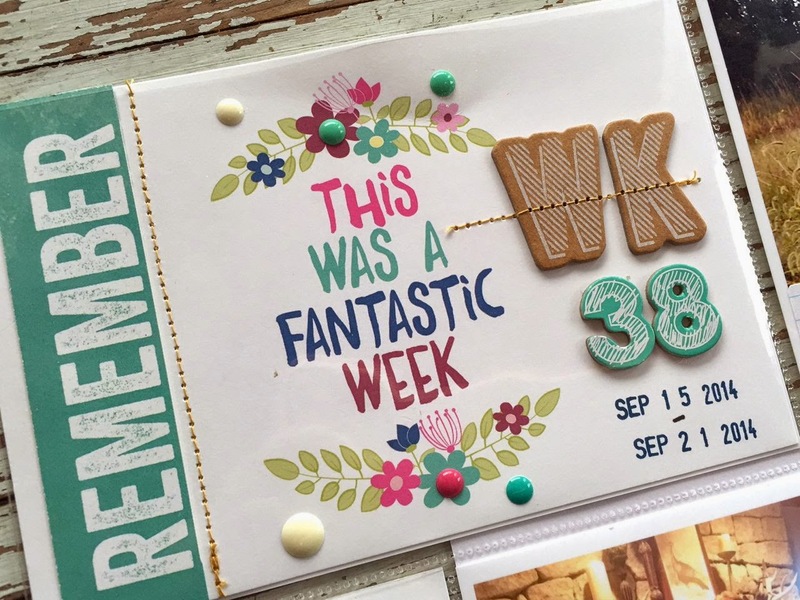 For my week number card I used a One Little Bird digital overlay and added the date. I used Dropbox to import the overlay into the LetterGlow app. 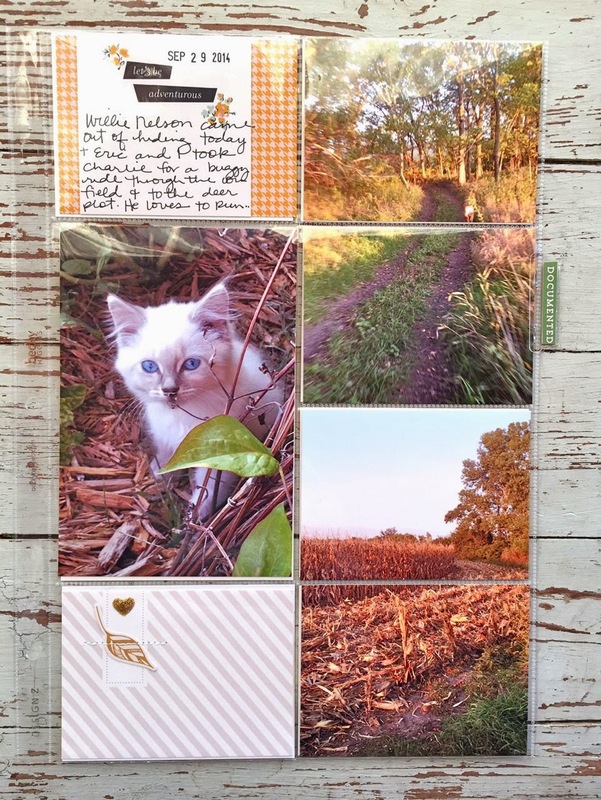 This is the weekly spread with the front of an 8" x 12"insert cut down from a 12 x 12 Project Life Z Page Protector. The photos were just more random photos from the week but they were all of nature so I collaged them together on one page. Here's a closeup of that insert. Turning the page you can see the back side of the 8" x 12" insert. You can also see another 5" x 7" insert on the right side. Here's the two pages together. These two inserts coordinate with one another. I copied a blog post into a word document and printed it at 4 x 6 size. 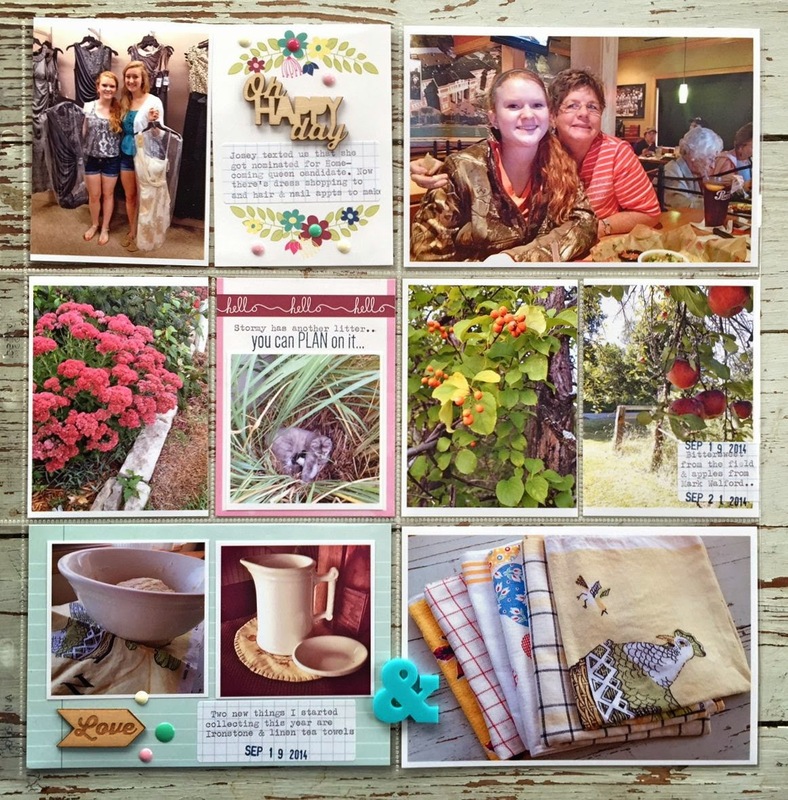 Title is cut from a One Little Bird journaling card and leaf is from Gossamer Blue's Gramercy Road collection. 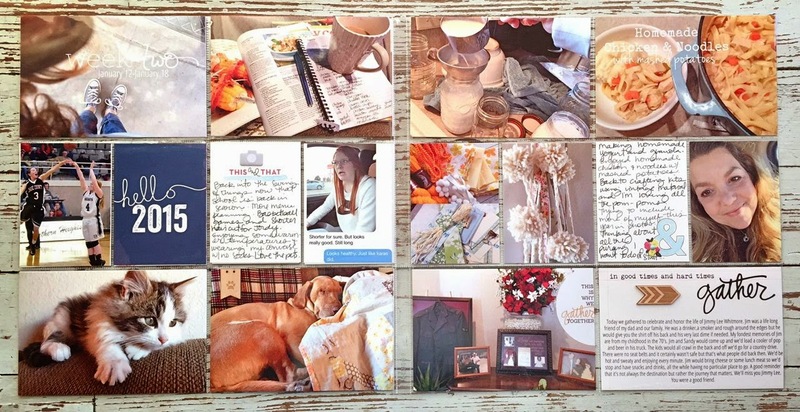 Boy, Ali Edwards hits it right on the money when she uses her blog posts for journaling. 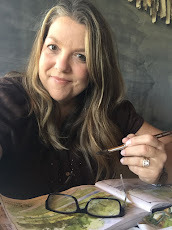 I think I'm going to start adding more stories to my blog so I can do the same. So easy to get a full story instead of trying to do it when you're assembling layouts. Turning the page again, you can see the back side of the 5 x 7 insert. 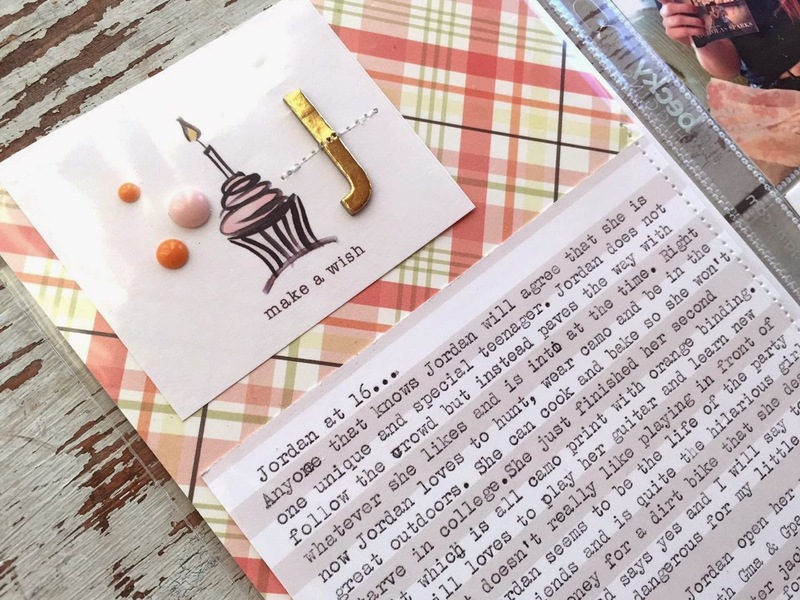 This insert coordinates with the 12 x 12 page of Jordan's birthday. Patterned background is from a Gossamer Blue kit. Cake piece is from a One Little Bird journaling card. 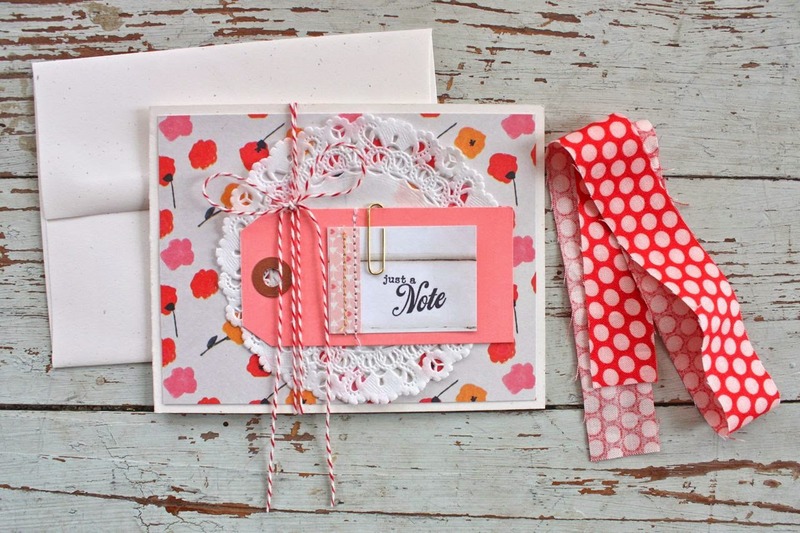 Embellishments and lined journaling card are from Gossamer Blue kits and shop. 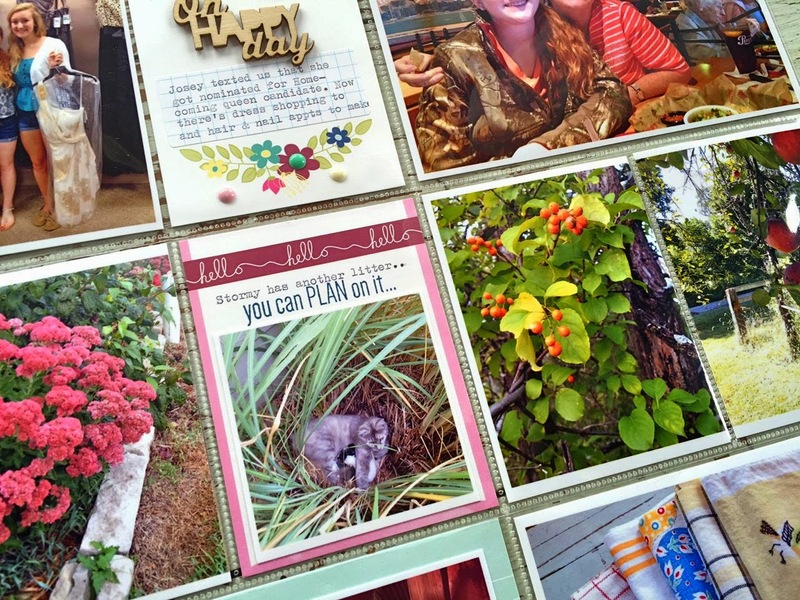 Here's some of the One Little Bird journaling cards I used for Jordan's birthday. Gosh, I love them so. Simple, not too much color, lots of white space. Just the look I'm going for this year. 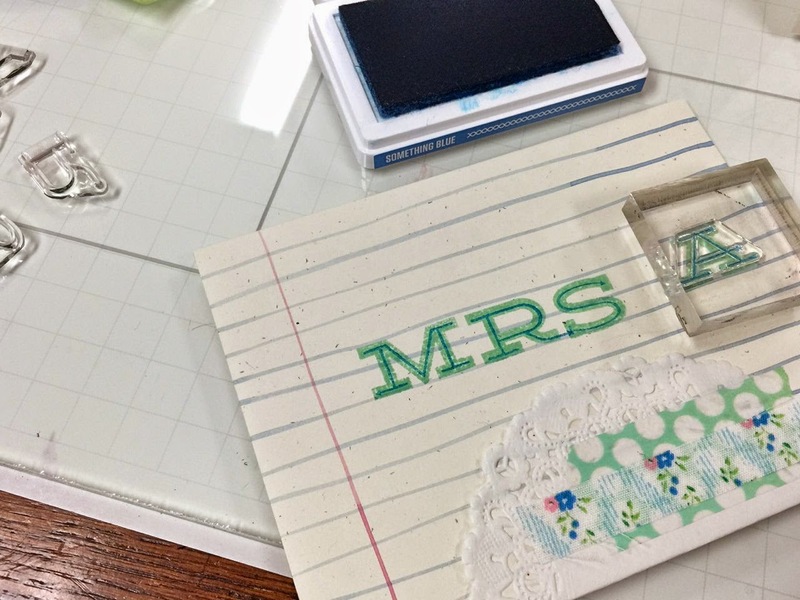 Wood veneer is from Studio Calico and gold letters are from a Gossamer Blue kit, from American Crafts. That's it for this week. Hope you are inspired and enjoy my project! 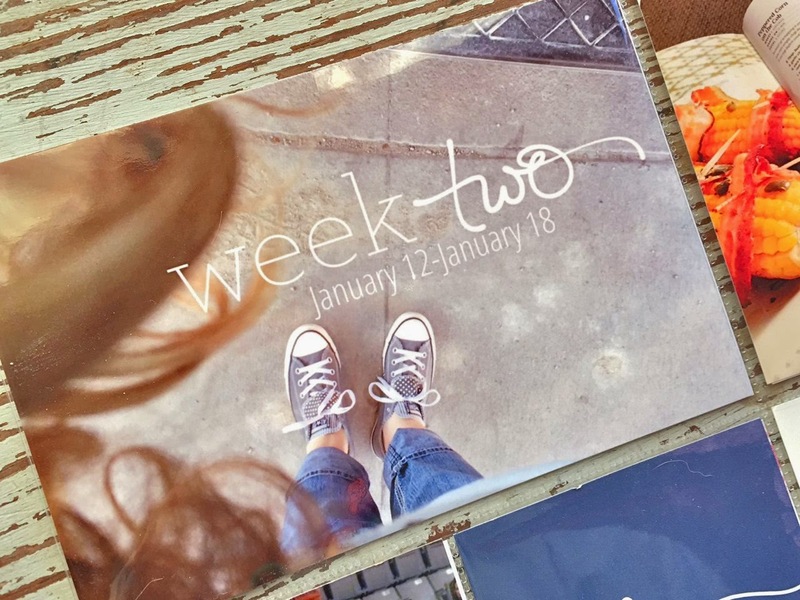 Up on the blog today, I'm sharing my Week 2 of my Project Life 2015. 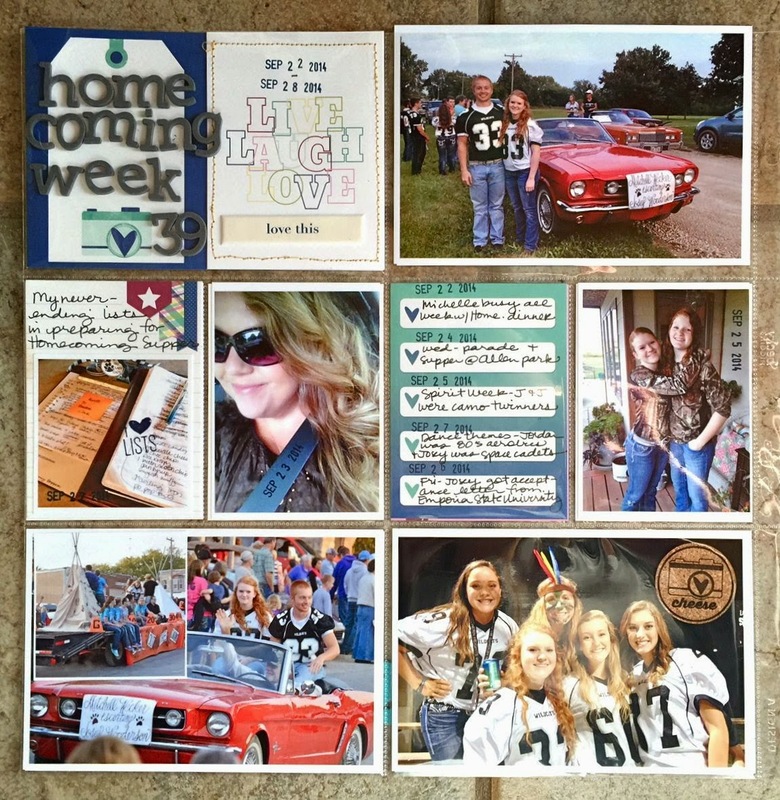 Lots of photos this week so the layout is kept simple. 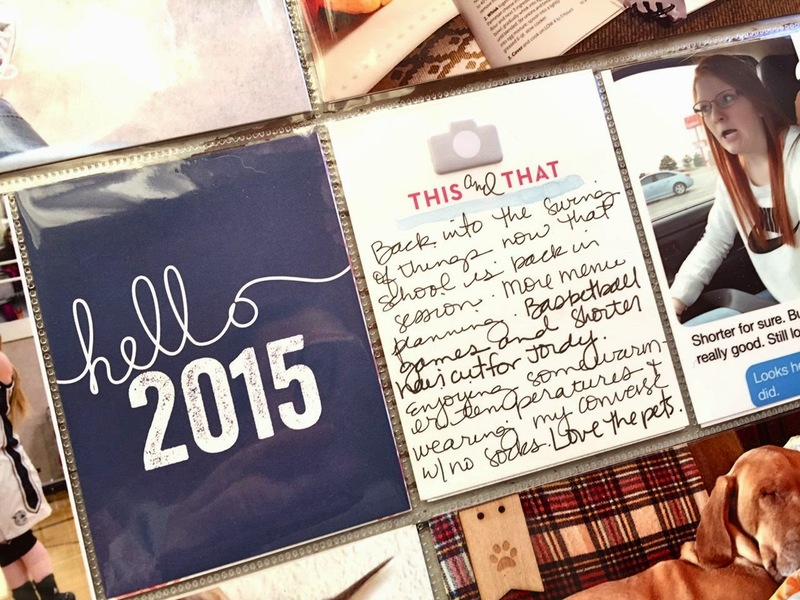 The hello 2015 is from Gossamer Blue as well as the journaling cards I used this week. Camera puffy sticker is from Evalicious. I used a little bit of blue watercoloring under the this and that title. For my bottom two 4 x 6 inserts I did some journaling about a family friend's funeral. I know it sounds odd but in Ali's videos in her Gathering Story Kit she talked about the various reasons why we gather. Jimmy's funeral was a celebration of his life. I saw lots of people I hadn't seen in years that were getting elderly. We were happy to see each other even in this circumstance. As I sat and listened to the service, I reflected on some good memories. Worthy enough to get the story down in the books. 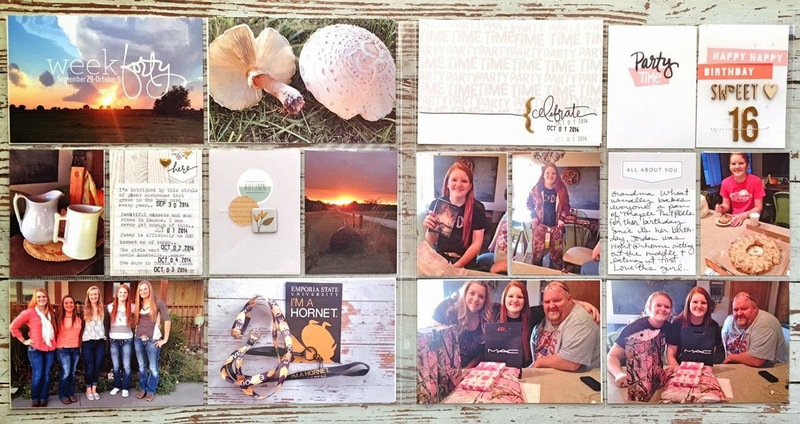 For my photos, I used 3 separate overlays from Ali's Gathering product line. 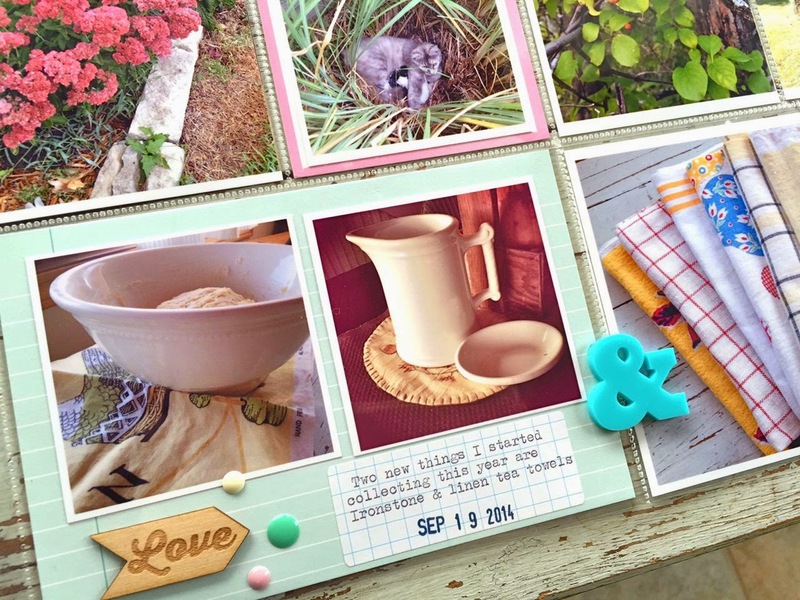 I typed out the journaling using the Project Life app on my phone. 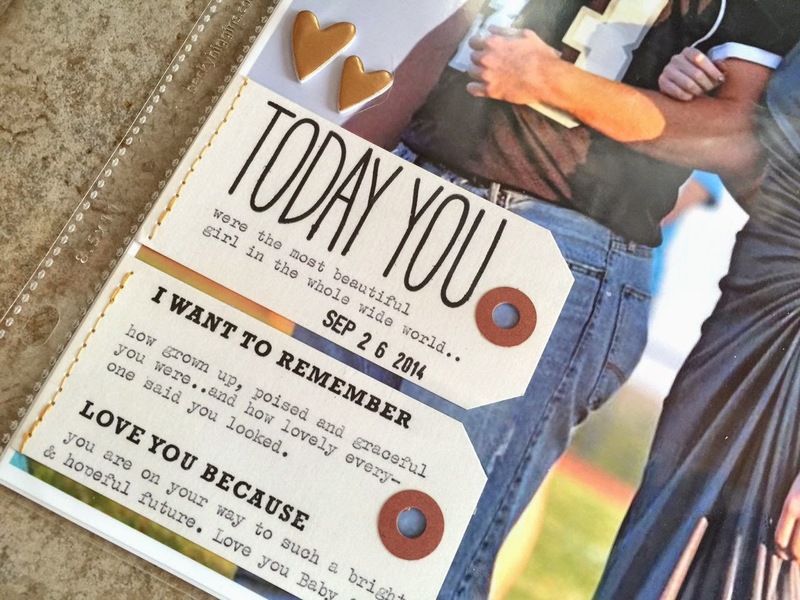 The wood veneer arrow is from Gossamer Blue. On the journaling card at the top, I used more blue watercoloring to fill in the ampersand. Thanks for stopping by today. Hope you are getting the stories + photos in those albums. 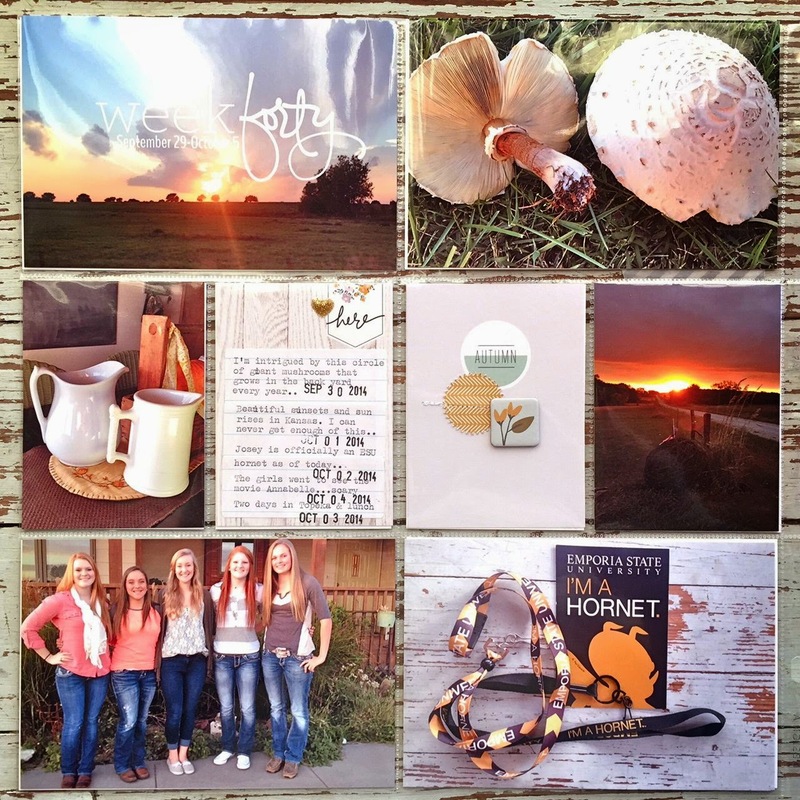 Sharing Week 39 of my 2014 Project Life. For this week's spread I used the January kits from Gossamer Blue. 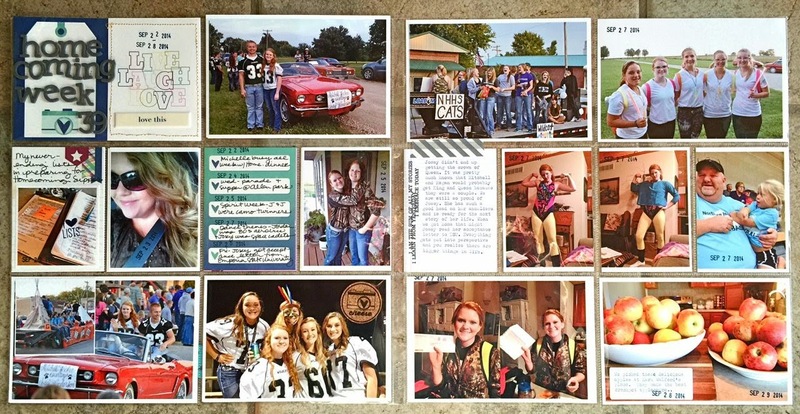 It was Homecoming week so mostly all of the photos revolve around those activities. The left page. Lots of photos from the Homecoming parade. Josey was escorted by her cousin Mitchell and they rode in my dad's red mustang, with my dad driving it in the parade. A total family affair. Embracing my own handwriting for journaling. The right page. Jordan's class float, Josey and the Senior girls dressed for their class theme for the dance. Josey cracking me up in her 80's aerobic instructor themed outfit. Josey got her acceptance letter to her college of choice. More apples from a friend. Foam letters for the title card. 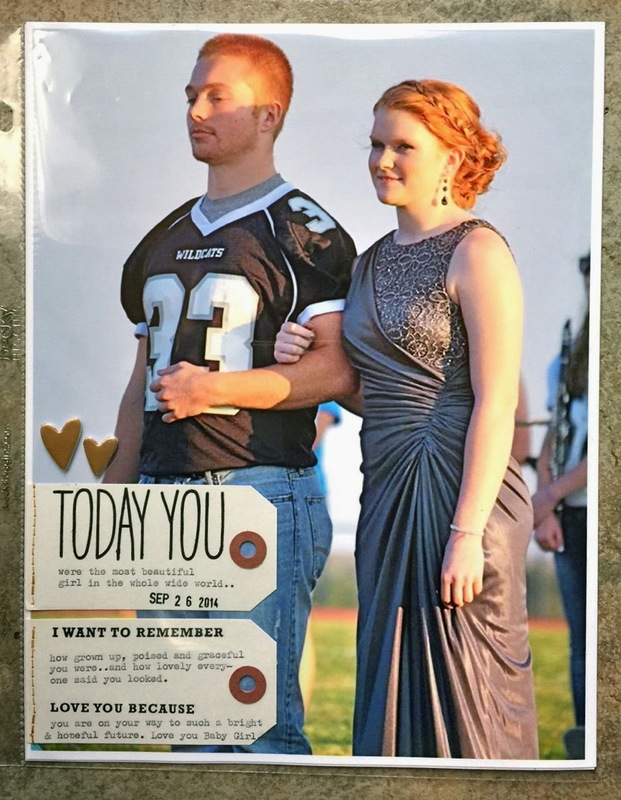 An 8.5" x 11" insert of Josey and Cousin Mitchell at the Homecoming ceremony. My girl was stunning. I mean, just really beautiful and poised and so grown up. I get moistness in the eyes just looking at this photo. On a side note, my nephew is a redhead too. My family is keeping the redheads alive in our neck of the woods. May the gingers live on! I used Ali Edward's Story Stamps on some manila tags from my shop for the journaling. Great memories this week. I recall that I have a few photos from when I was a Homecoming candidate. Wish I had more like this. I know my girls will love looking back on these albums some day. Keep pushing on with your albums, my friends. Whether your two weeks, two months or two years behind......it will all be worth it to keep catching up. Have a great Sunday everyone. Chef Woody made us his famous Amish pancakes (actually, my recipe but he's the pancake cooker around here so he takes full credit). Got homemade pizza planned for supper and Josey and I are going to watch the new Hallmark movie tonight about the swans. Til then we're in relax mode. 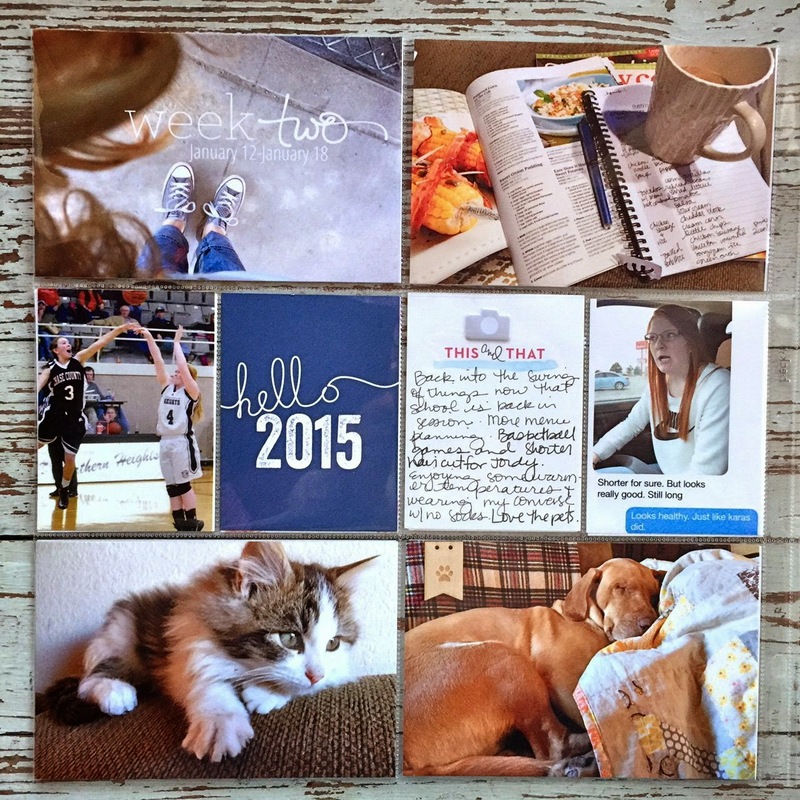 I'm going to catch up on some of my 2014 Project Life. 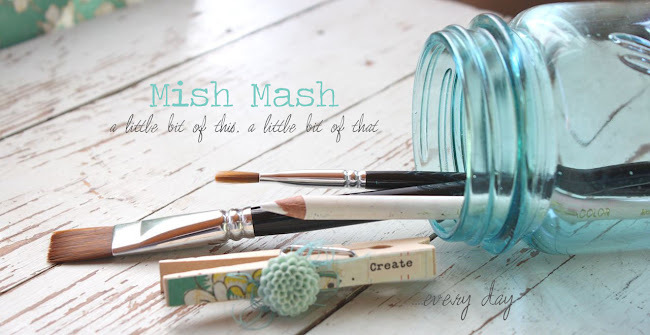 Oh and check out my Instagram and Twitter feeds for some fun sneak peeks of the upcoming February Gossamer Blue kits. I'm featuring my faves from each kit. Happy weekend everyone! 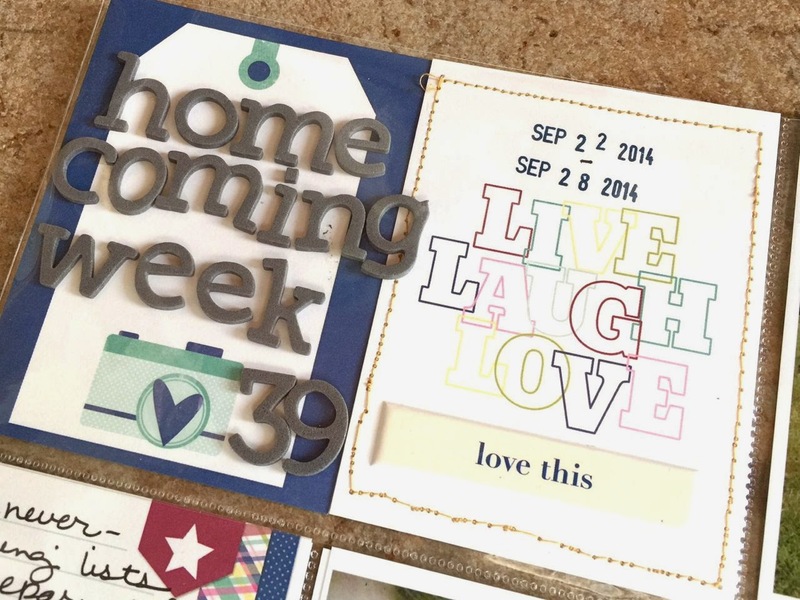 Today I'm sharing Week 38 of my Project Life. 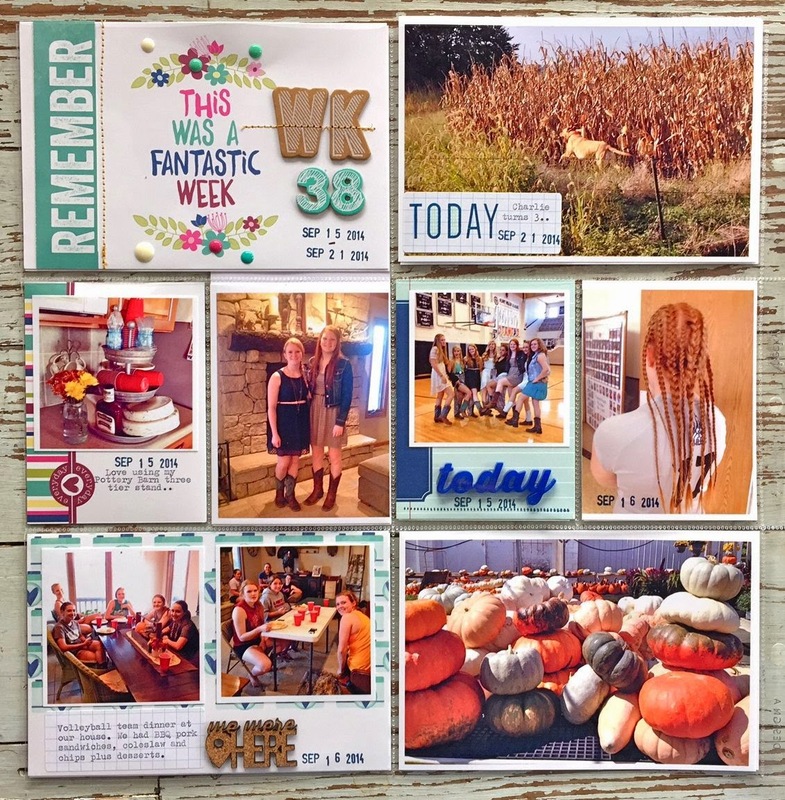 I used Gossamer Blue January kits for my spreads this week. 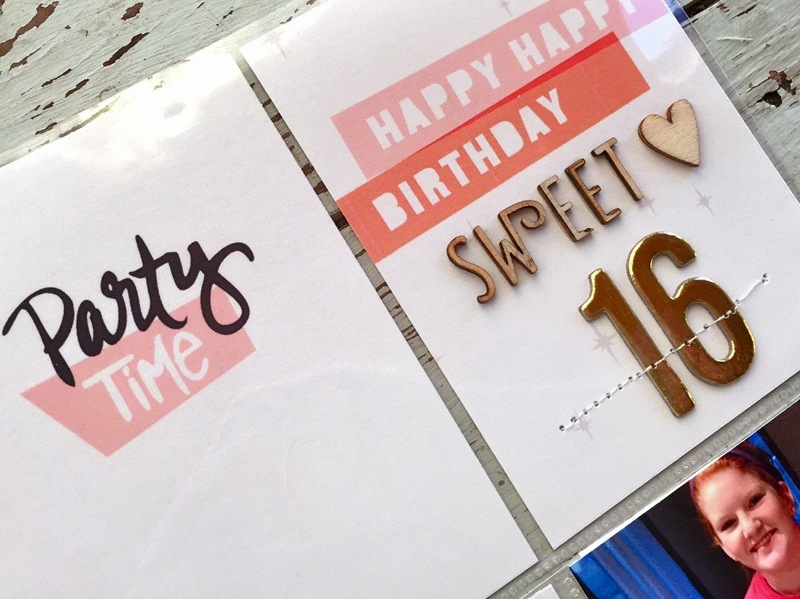 Love me some chipboard letters and numbers. 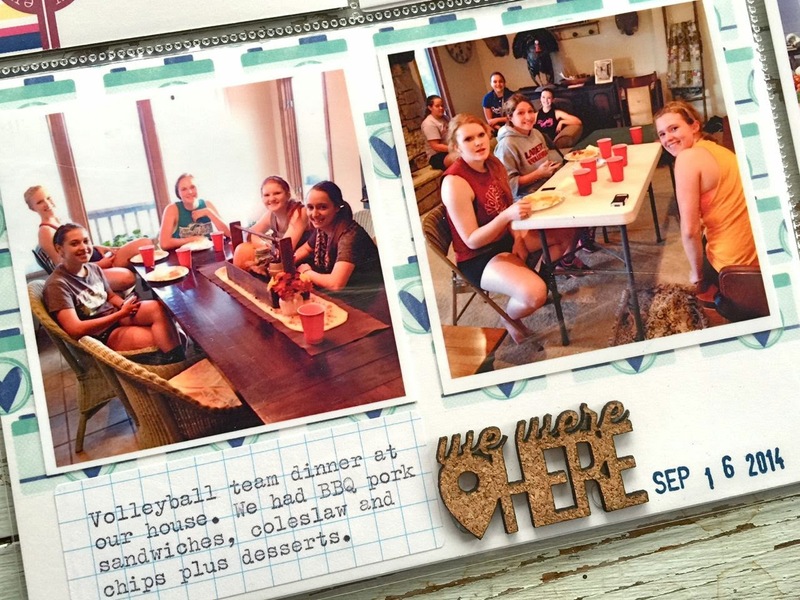 Volleyball team dinner at our house. I used a cork piece with a geotag on this 4 x 6 insert. Dress shopping for Homecoming. I'm loving the wood veneer pieces from Gossamer Blue. 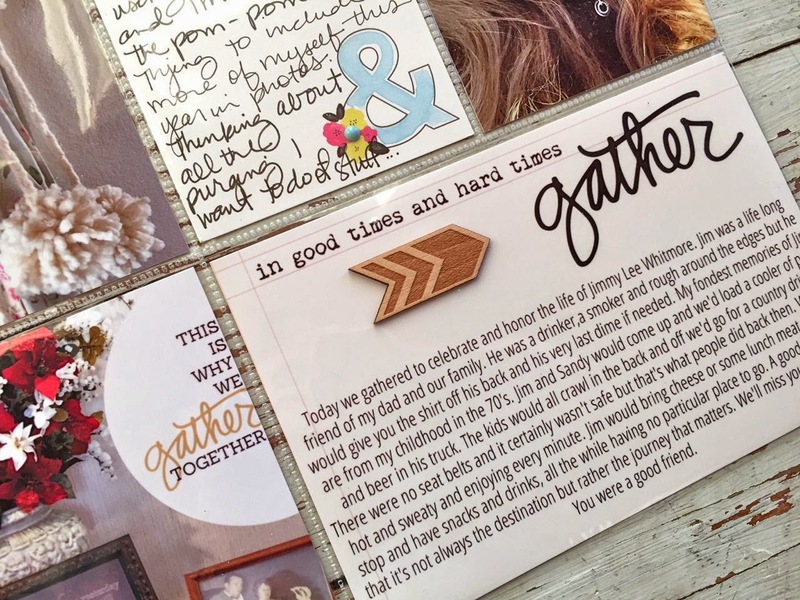 They add just the right touch to a journaling card or photo. More wood veneer, some enamel dots and the fun plastic ampersand. I adhered this on top of my page protector. 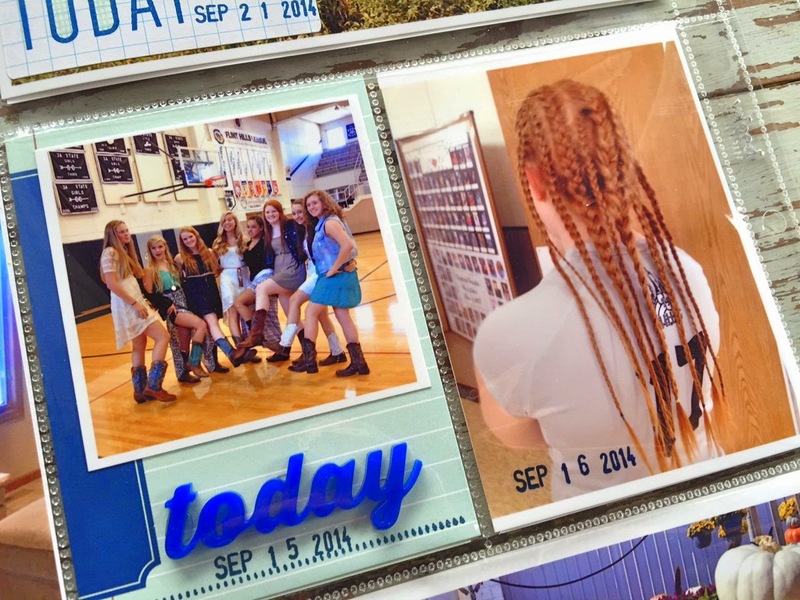 Josey decided it would be fun to do cornrows for a volleyball game. What the? 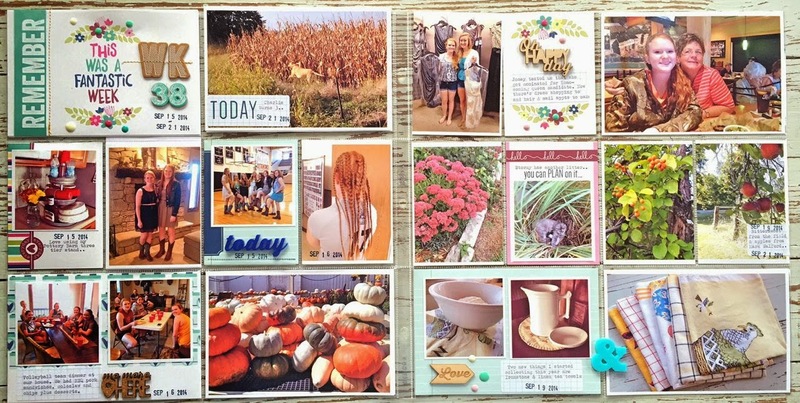 Another plastic piece is on the 3 x 4 journaling card. Lots of photos, new baby kitties, and I found a vine of Bittersweet on a ride with Charlie. Another week in the books. I'm off to a basketball tournament today. Hope you enjoy your weekend. NEW Wrappings Kits in the shop..
Hey there. Today I have two new wrappings kits going up in my shop. You can find both kits here. 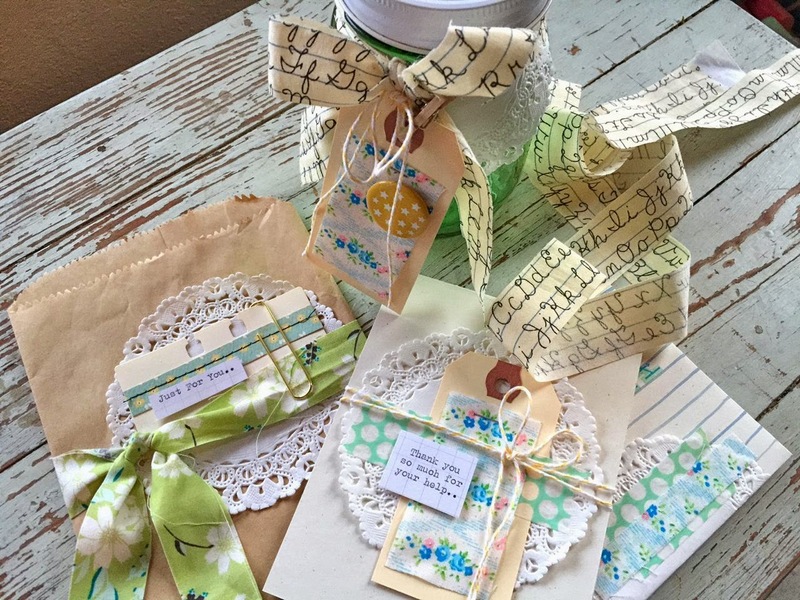 First up is the Green Wrappings Kit which has some whimsical strips of fabric, hand crafted tags, stitched items and some unique, hand watercolored notebook envelopes + lots more. 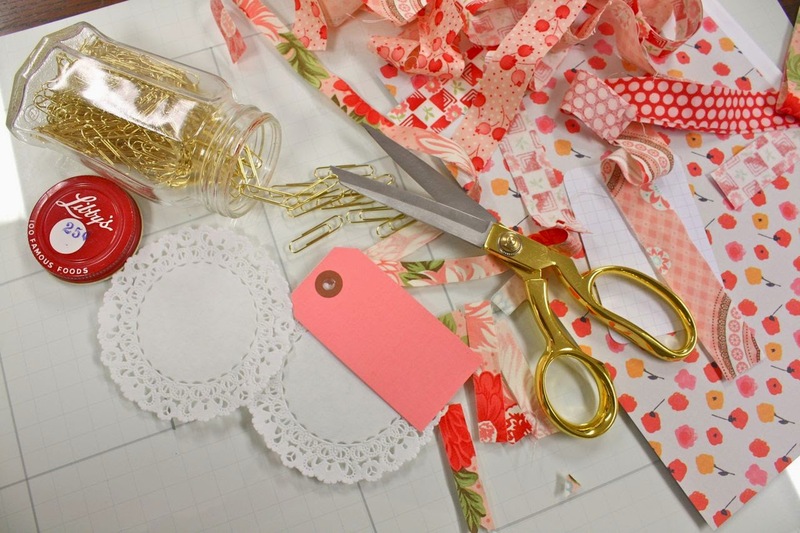 My idea when assembling these kits is to just assemble a bunch of cute, mixy matchy items that are fun to open and just spread out on your work table. Sometimes it's just a little something new that can spark that creativity. There's no right or wrong.....you just sit down and see what you can create. 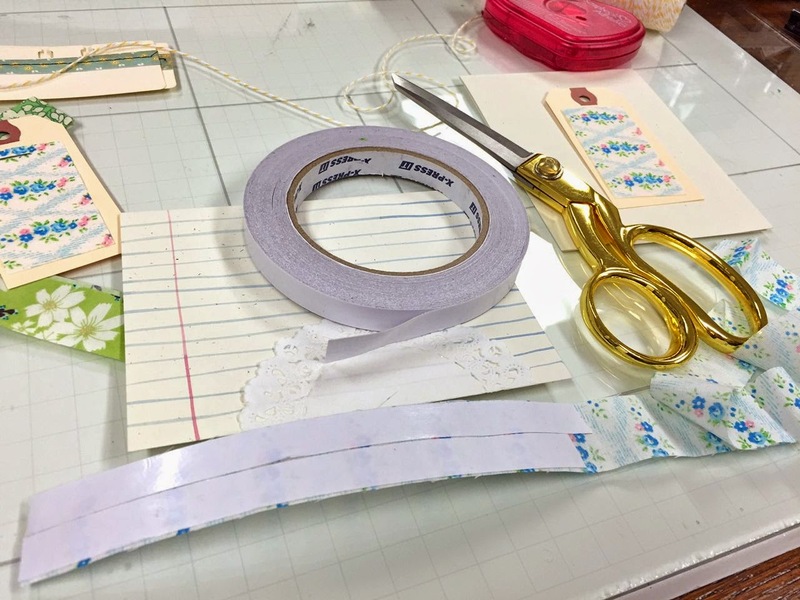 I was especially inspired with my own two kits because I have recently purged a lot of crafty items that I no longer used and I had a fresh, clean table to work on. Here I decided to create some fabric tape by applying two strips of double sided tape to a fabric strip. I cut the strips down the middle to have two long strips of fabric tape. I knew I wanted to make something special with that notebook paper envelope too. I dug out some letter stamps that hadn't seen ink yet. All the little bits and pieces from the kit just inspired me to get out new products and to see what I could pull from my stash to use with the kit items. 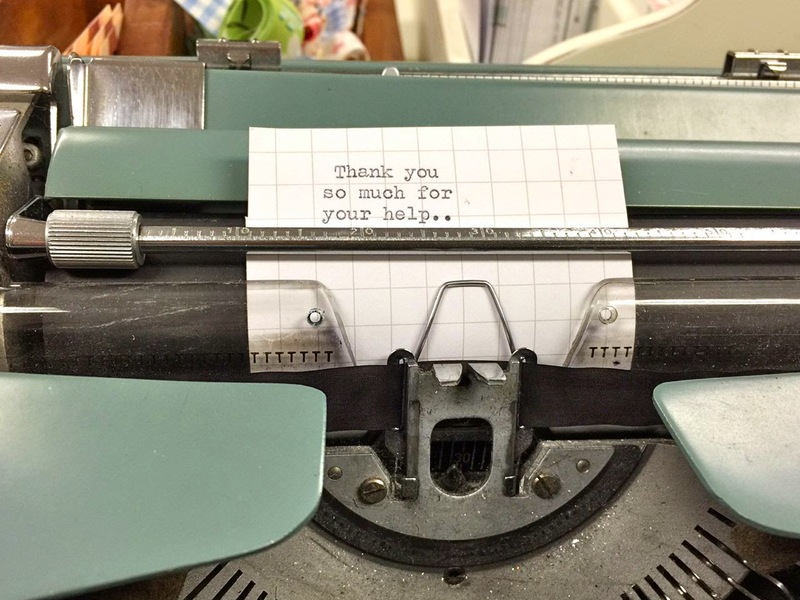 I used my typewriter to create some one of a kind sentiments. The result was a delightful little pile of goodies, each crafted with a specific use in mind. Just looking at the goodies below makes me want to craft even more. 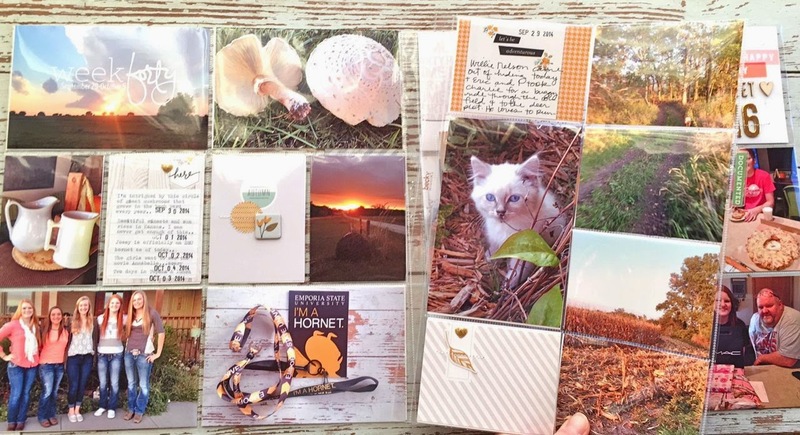 It's so fun to get a little stash going so that when you need a card or some cute gift wrap, you're not scurrying around to find something. 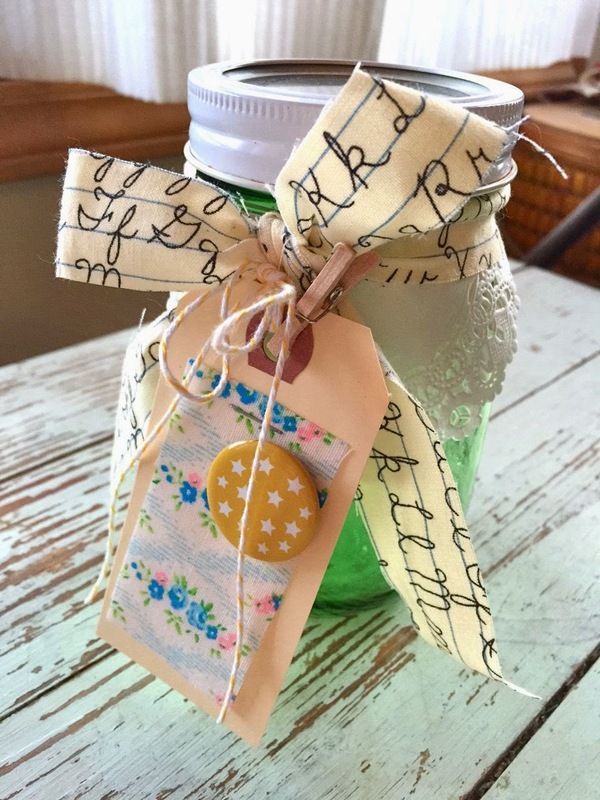 This green mason jar got a cute facelift with a doily, a fancied up tag from the kit and a wrapping of the alphabet ribbon. I can fill this with candies for a teacher or take the lid off and fill with pencils or paint brushes. 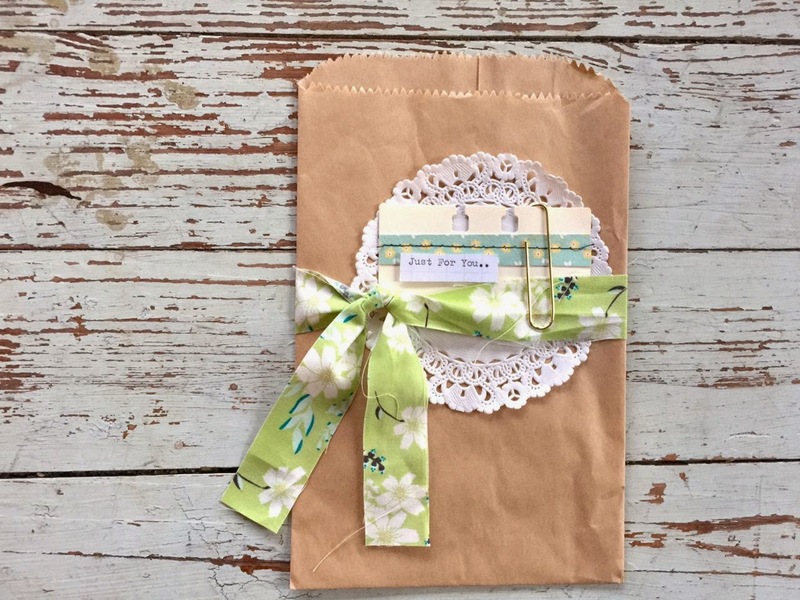 This little gift sack a Large Kraft Sack, another item I like to keep in my craft stash. 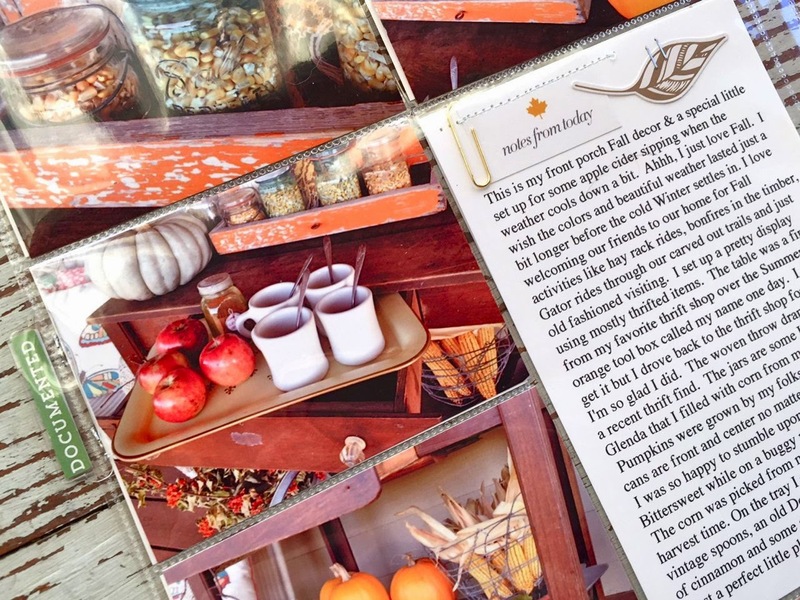 All of the embellishments come straight for the kit with the addition of the typed sentiment. 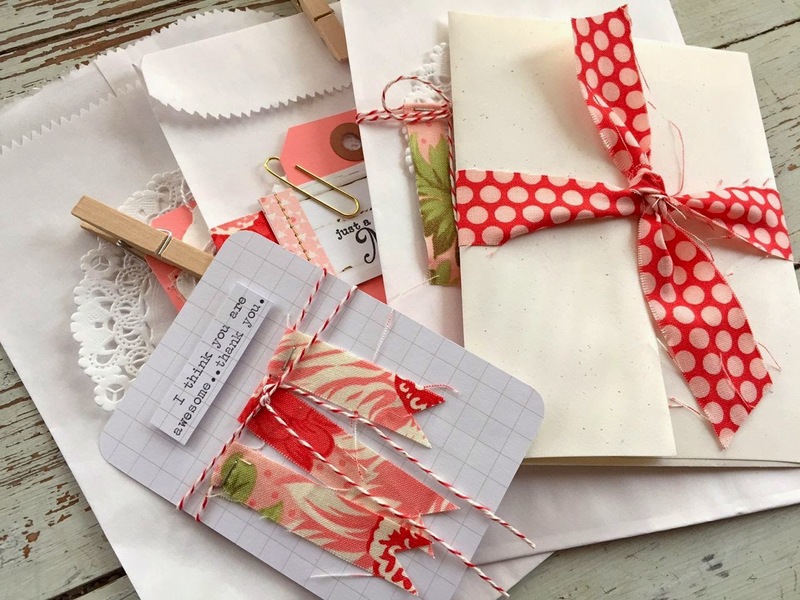 I plan on adding in some coordinating cards and sending this to Bonnie Christine who was so gracious to include me in her Winged blog tour, featuring her new fabric line. 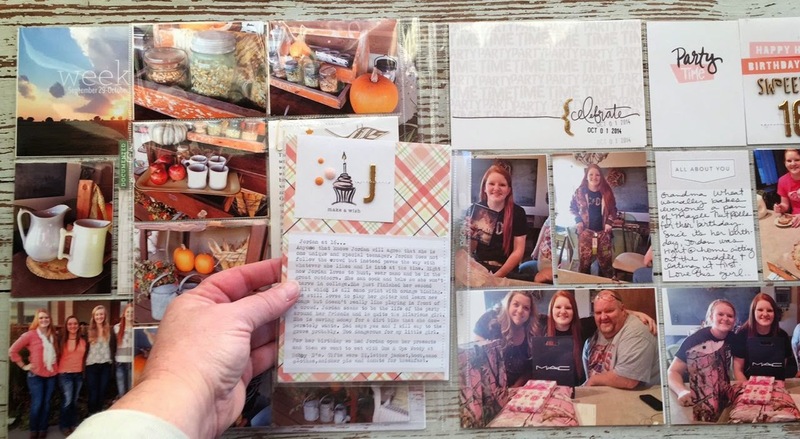 This card with coordinating envelope was created for my old English teacher who recently helped Josey write her resume and some scholarship letters. I love the dainty, old fashioned look of this duo. 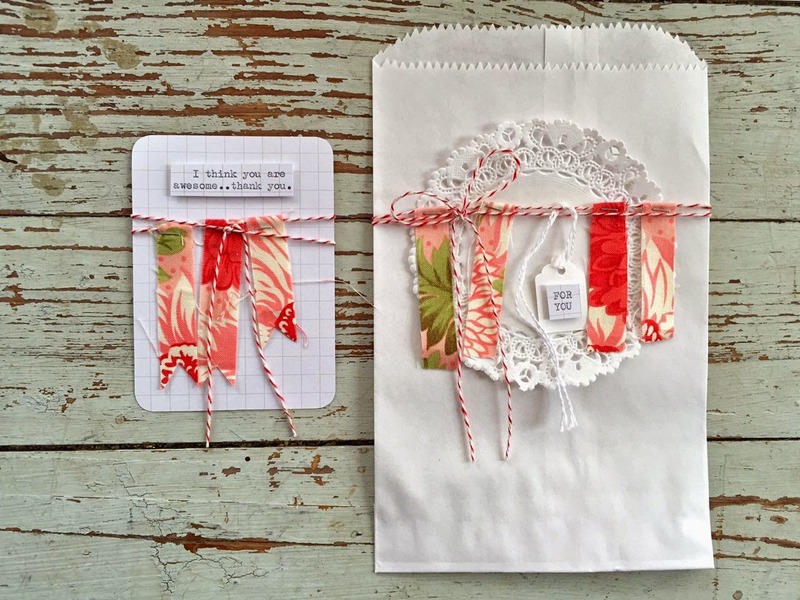 I added in some wide washi tape from my stash and used the fabric tape on the envelope. 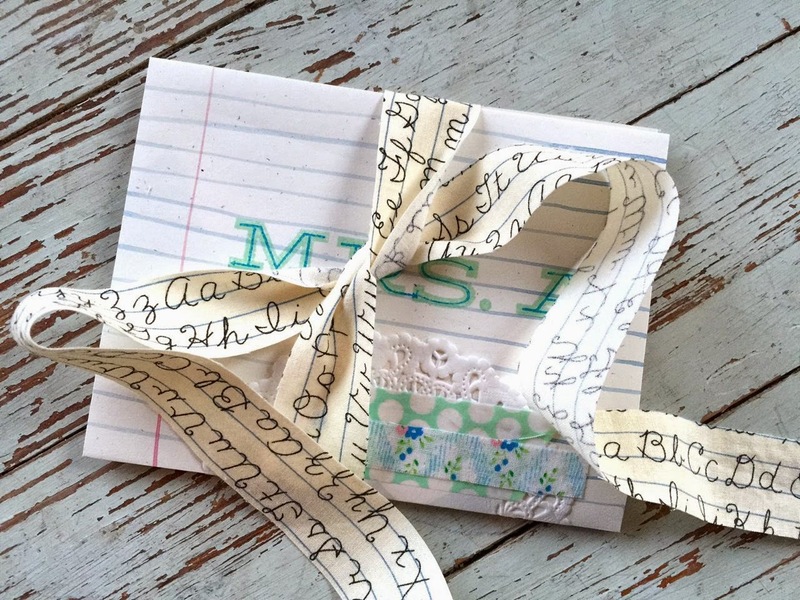 I plan to tie the envelope up with some of the alphabet ribbon from the kit and slip a candy bar under the bow. 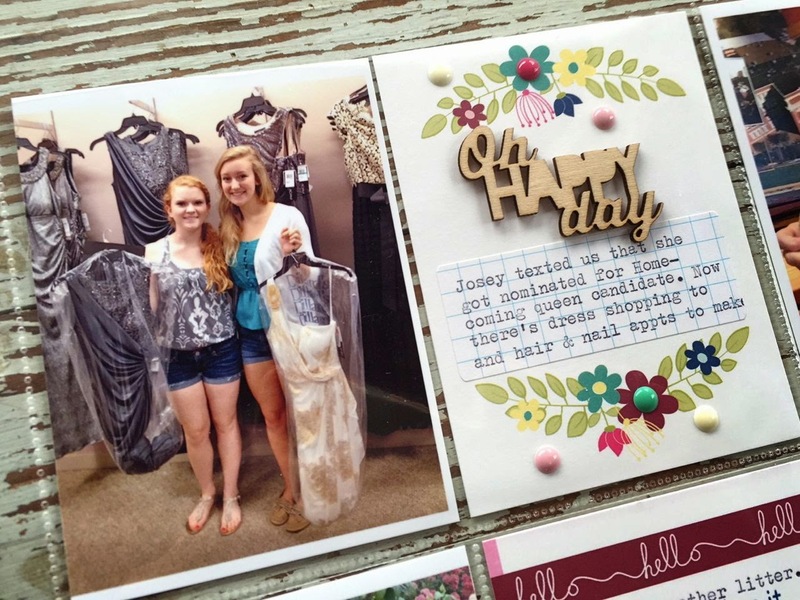 A thoughtful little card and gift that Josey can deliver to Mrs. A. 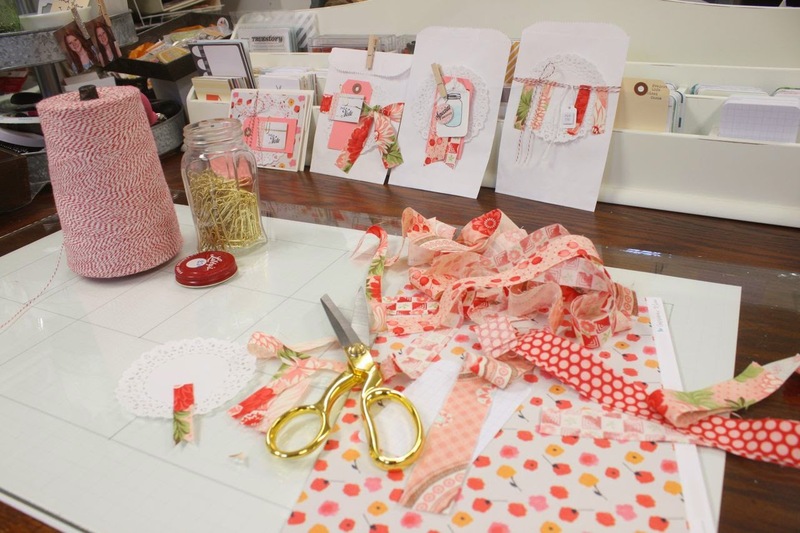 My next kit is the Red Wrappings Kit which can be used just in time for Valentine's crafting or just on it's own. Again, it's fun to just open up your package and spread all the goodies out to see what you can dream up. I've been keeping extras from the kit in some cute little baskets and every time I walk by them it sparks some ideas. 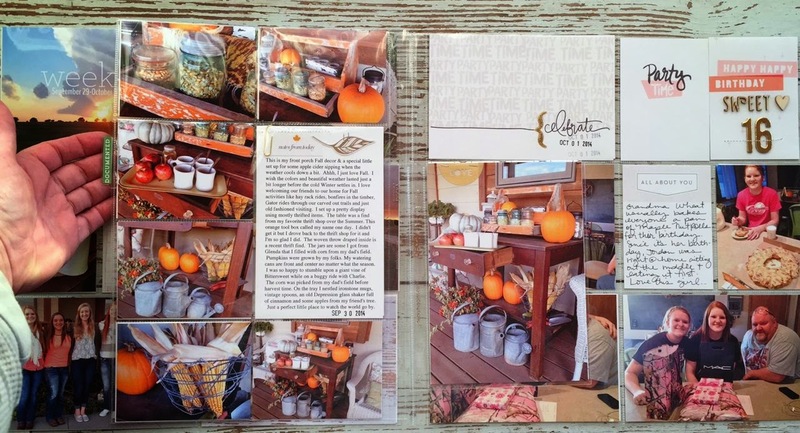 If you purchase my kits, I suggest gathering up the items and storing them in some cute way. 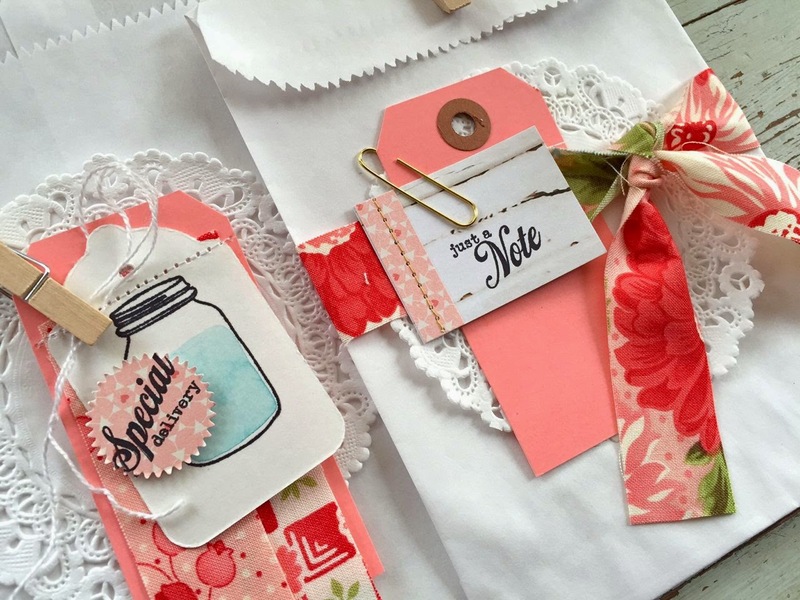 You can mix and match the kits and if you grab some other shop items like tags and sacks you'll always have some fun gift wrappings or card embellishments at your reach. 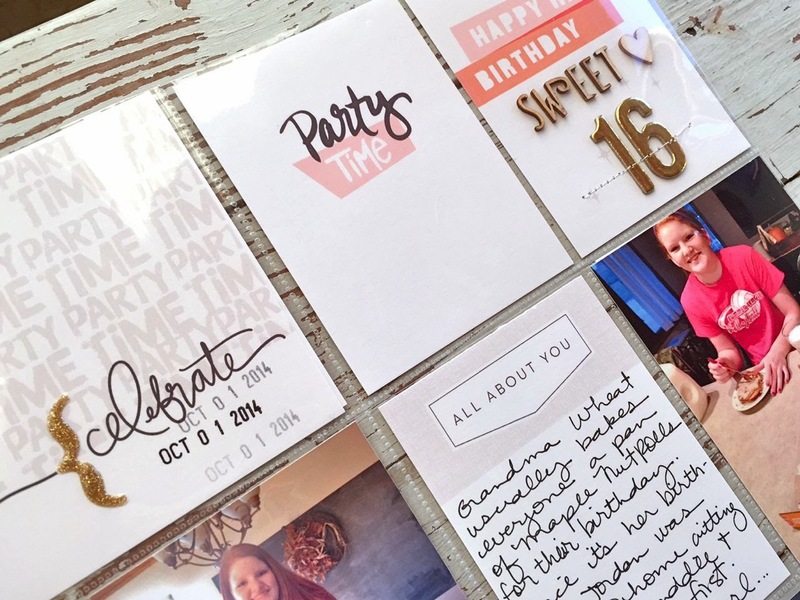 All I need to create this card is just a piece of patterned paper. The rest of the items are just layered and come from the kit. 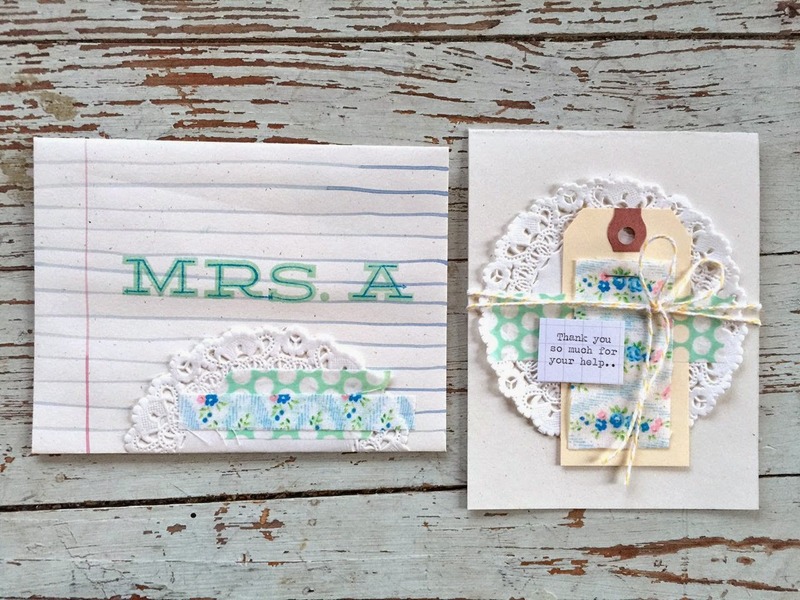 I'll tie up the card with the cute polka dot ribbon. The little stamped piece has some stitching on it already so that handmade touch is already added. 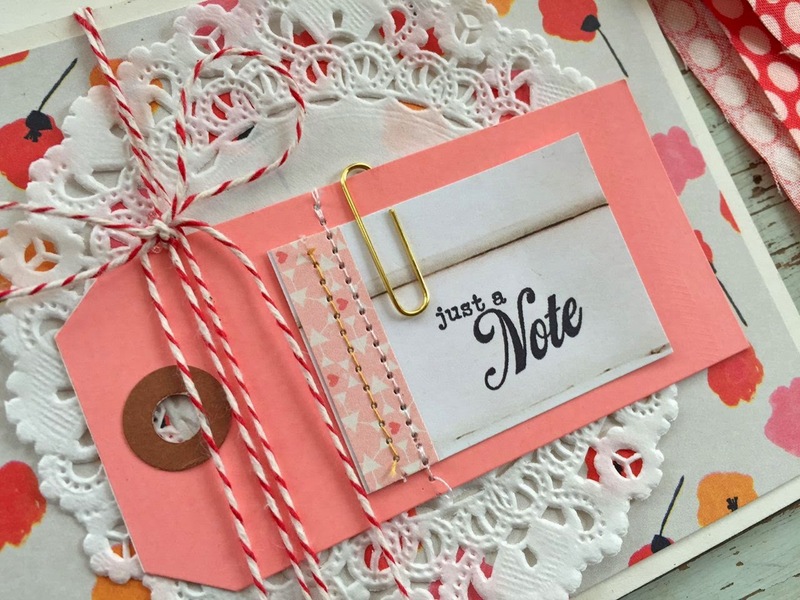 Little paper clips and baker's twine add some dimensional touches. The Large White Sacks are included in the kit but you can purchase extras in the shop. 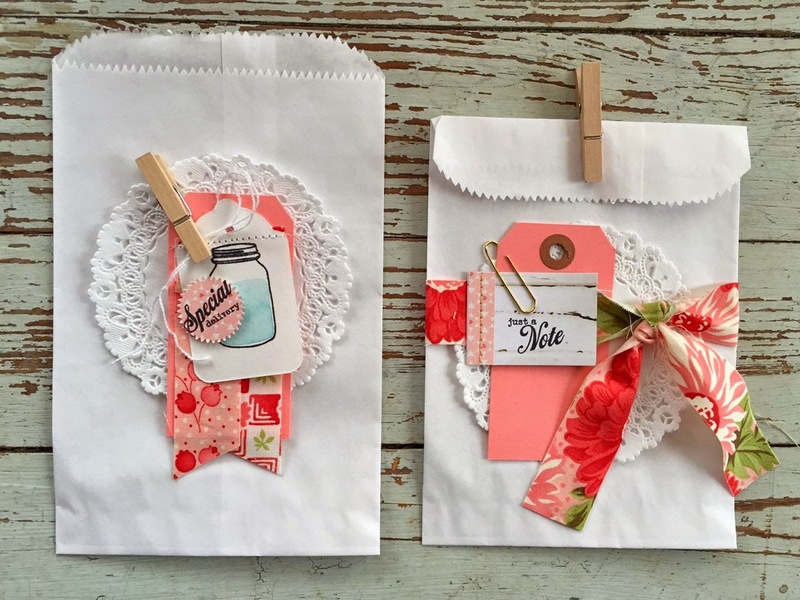 I layered the Dainty Doilies with pink tags and the stamped tags from the kit. For each sack I used the ribbon strips in different ways. Paperclips and Small Clothespins finish off the sacks. The Large White Tags are just one of the many shop items I carry that I consider staples in my crafty stash. For these next pieces, I cut some of the fabric strips in half and then cut little pieces to staple of the baker's twine in the kit. Garlands are a popular item for decorating right now so these mini versions make me very happy. I used my typewriter to create some typed sentiments. Just cute and whimsical. 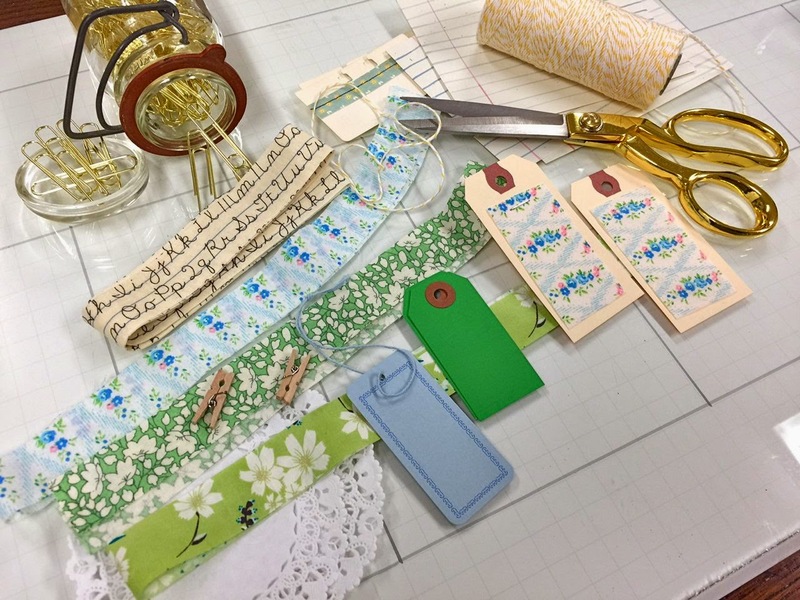 The Small White Tags are tiny little pieces just perfect for adding a short sentiment to a project. When I was done, I had yet another fun pile of crafty projects. I'm already thinking of people I want to send some goodies to. And isn't that why we craft? 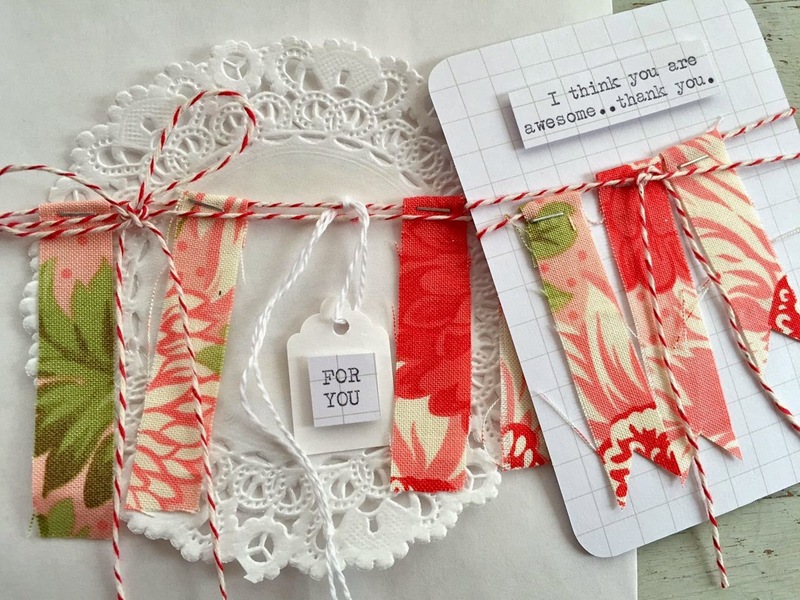 To create pretty things and to share them with others. 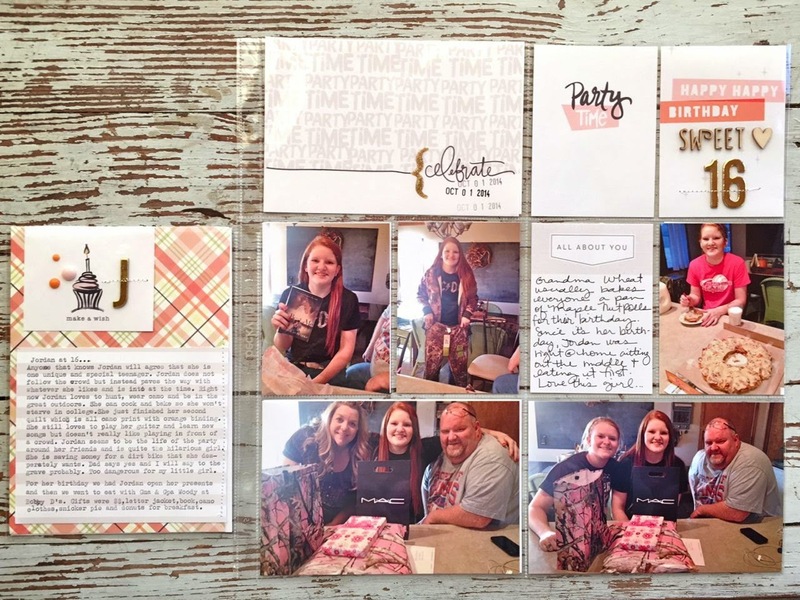 I know that when I send a card or hand out a gift that has been wrapped oh so cute, the recipient is overjoyed. That's what makes me happy. 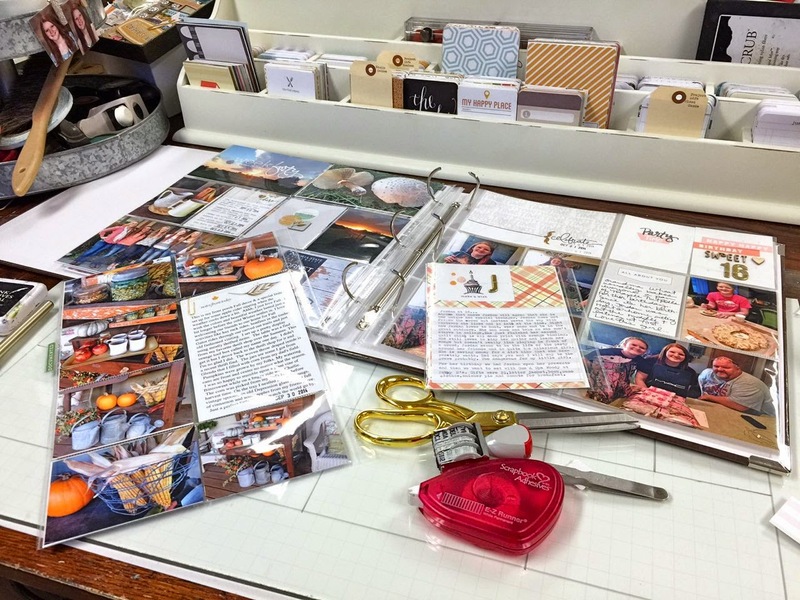 I hope you're year is off to a crafty start too!